Do you remember going to gym class as a kid, all excited about what activity the teacher was going to make everyone do next? It was always fun for me, especially if it was something that I was reasonably good at, like badminton. The gym teacher always made sure the sport was something that everyone could participate in, no matter how tall, short, fat, skinny, or uncoordinated you were. Equal opportunity sports. I presume it’s the same in Sweden, but the types of sports you play in gym class in Sweden are probably a little different. For example, brännboll, literally, “burn ball.” It’s a little like baseball, but the rules are different. Then there’s another game that I recently re-discovered called innebandy. I played for the first time in 2007 but didn’t play again until January of this year. And now I am hooked! 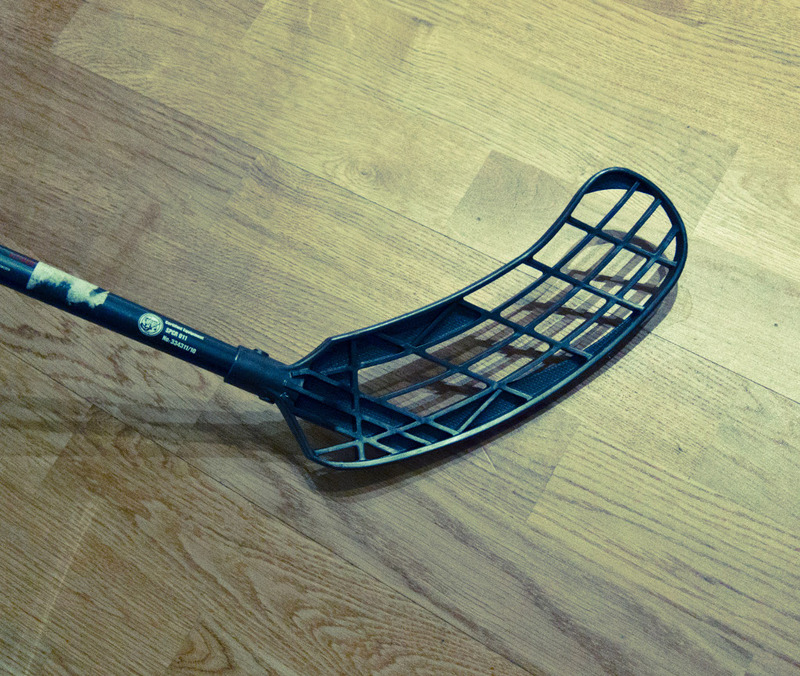 Think of it as indoor hockey played with a light stick and a wiffle ball. Two teams, usually about 3-4 players per team, and the objective is to score in the opponent’s goal. It is uncomplicated – not a lot of rules. Hit the wiffle ball with a stick and get it into the goal. Sounds easy, right? But don’t you snub your nose at this sport – if you’re a beginner and not in decent shape, you will get wasted your first time. Because you play in such short spurts, you tend to run around the court every single minute that you’re in the game, trying to get control of the ball and score, while avoiding the other players so they don’t steal the ball from you. Then you beg for someone to rotate in for you so you can take a breather, drink some water, and ask yourself why you are submitting yourself to such pain. This sport also highlighted how much I needed to work out. After my first session in January, I was so sore for three days that I could not walk or sit without wincing in pain. I was sore in places where a) I didn’t even I had muscles, and b) I didn’t know I could be sore in those areas. But it felt so great to have played and worked out, and the time goes by very quickly. Before you know it, you’ve been running around like a headless chicken for 2 hours. Most Swedes have played innebandy at least once in their lives, and many continue now through work leagues, or with their friends like I do. It’s their equivalent of gym class basketball or baseball. It’s a fun social sport. And it’s Truly Swedish – try it sometime. This entry was posted in innebandy, Sports on March 2, 2011 by Kenneth Chen. That sounds amazingly fun. Of course, I’d be dead on the floor of the gym before I even got started because I’m so out of shape. Nice to read your post. I’m a spanish girl (30) and I would like to try Innebandy. I am not usually to do sports…so I think it is time… 🙂 I’m living in Stockholm now and I would like to ask you if you know or recommend me where can I learn it as a beginner! I really would like to start! !